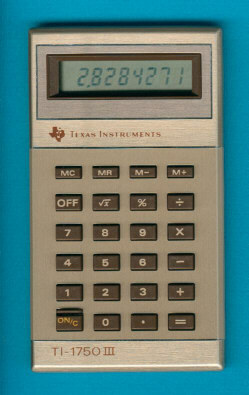 The TI-1750-III carries a famous name, it seems to be the successor of the first TI LCD calculator, the TI-1750. Well, to be honest to you, under the hood this calculator is nothing else than another design of the original TI-1030 calculator. Not as exciting as the TI-1760 DataCard. The same housing was used for the Time Manager sporting an integrated clock with two 24-hour alarms and a stopwatch. That's the power of marketing! Deluxe pocket portable with memory. Light. Small. Economical. Weighs only 2½ ounces. Performs today’s most needed math functions. Add-ons, discounts, square roots, percentages. Even has a four-key memory Large easy-to-read liquid crystal display shows 8 digits plus overflow, minus and memory signs. TI’s APD*, automatic power down feature, helps prevent accidental bat¬tery drain by turning off the calculator after approximately four minutes of non-use. Comes in brown vinyl wallet folder, with pockets for notes, cards, stamps, etc.